South Hadley resident Norma McCain was expecting her annual mammogram in January at Baystate Radiology to run smoothly, as usual. But those two little words put a wrench in her plans. Her thoughts turned immediately to not being able to grow old with her grandchildren. But Norma remained optimistic. She sought the silver lining. Her doctor told Norma the breast cancer, ductal carcinoma in situ, was small, Stage 0 and 1. “This is doable,” she thought. Only a mammogram could have detected the small tumor. The type of cancer she had does not spread through cell walls and it had not yet spread to Norma’s lymph nodes. “I felt like I was very lucky,” she said. What she found was the more she talked with others, radiologists, family, friends and those she met in the waiting rooms, the more she learned about breast cancer and was able to share her own experience. “Out of this bad thing, it really turned out to be an enlightening experience,” she said. “I didn’t try to hide it. The more I got it out there, the more I talked about it, the more I was learning. It was like, just get it out there, talk about it! That, I found, to be very helpful,” she said. “This whole experience, it affects so many people,” said Norma. The amount of those battling the disease was eye opening for her. “I couldn’t believe how busy the waiting rooms were wherever I went,” she said. Through this experience, Norma chose to remain optimistic, a trend she discovered through the majority of people she met and with whom she conversed. Today, Norma feels like the word “lucky” is insufficient for describing her experience with breast cancer. She credits her life, being able to play with and watch her grandchildren grow, to a routine mammogram. Those “further evaluations” which initially scared her became a lifesaver. Norma expresses her admiration to the staff at Baystate Radiology for finding her tumor and their diligent work. – Those willing to share their personal stories should contact Town Reminder Editor Kristin Will at kwill@turley.com or (413) 536-5333. 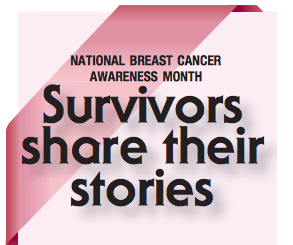 Short features will appear throughout October editions of the paper.